Made from breathable cotton this printed classic cap is all you need to top off your style. Allover palm tree camo print and a contrasting brand badge to front supplies eye-catching style whilst keeping you comfortably cool. Wipe clean with a damp cloth. :: Men > Hats and Caps. 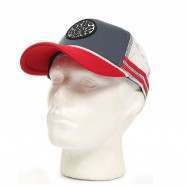 Material: 100% CottonExclusive to SurfdomeEmbroidered eyelets for ventilationAdjustable snapback fasteningEmbroidered branding to backLabel stitched to front Size: one size.